When a flood event strikes, it can devastate your home and your community. The residents of Texas unfortunately experienced this firsthand when Hurricane Harvey struck in 2017, causing $125 billion in damages. In the aftermath, residents of Houston and other communities were forced to deal with the storm after the storm and start rebuilding. 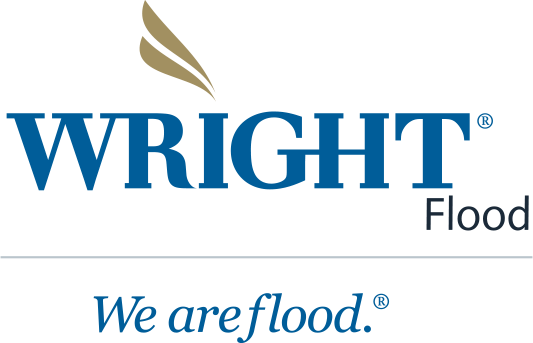 Wright Flood Insurance has been with them throughout the process, guiding them through the claims process and helping prepare them for this year’s hurricane season. Whether you live in a high flood risk zone or not, the importance of having flood insurance when a flood event occurs is undeniable. But more than 60% of property owners in recent flood tragedies did not have insurance. And when it comes to flooding, it’s just a matter of time. Ninety-eight percent of the counties in the U.S. have been impacted by serious flood events, including one-in-four low risk flood zones. Flood insurance can help make your family whole again after a large flooding event. But what do you need to consider when purchasing flood insurance or updating your policy? What impacts your ability to make a more complete recovery? From choosing the right coverage to learning more about how your coverage protects your home and family, understanding the three factors below will help you weather the storm after the storm by getting the most out of your flood insurance. Like any insurance policy, both National Flood Insurance Policy (NFIP) and private flood insurance policies have a deductible. For NFIP policies, you actually have two deductibles: One for your dwelling and one for your personal property. When a claim is made, you will be responsible for covering the cost of the deductible before your insurance coverage kicks in. So, how does this impact your settlement? When choosing your coverage, you may be attracted to a higher deductible that lowers your payment, but this also reduces how much the flood insurance company pays out on your claim. For example, if you choose a $2,500 deductible over a $1,000 deductible, your premium payment may go down by hundreds of dollars, but you will have to pay another $1,500 out of your pocket before your insurance covers anything. 2. Replacement Cost Value vs. Cash Valuation – Which Applies to Your Property? 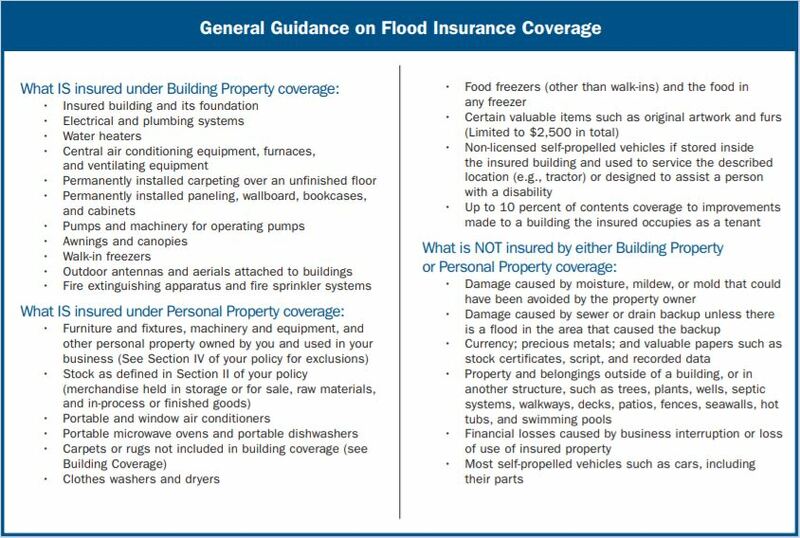 When you purchase an NFIP flood insurance policy, you are purchasing a policy that covers physical damage to your dwelling (or commercial building) that is a direct result of a flood. In the event a claim is made, your dwelling will be evaluated to determine if the damages will be covered under either Replacement Cost Value (RCV) or Actual Cash Value (ACV)…a distinction that could make a big impact on how much you receive for your claim. If your property does not fall under RCV, damaged property will be covered at Actual Cash Value, which considers depreciation of the property over time and factors it into the adjustment. From a financial standpoint, RCV typically results in higher payments on damaged property. While your dwelling may be covered under RCV, some building items always fall under ACV. For example, carpeting and appliances will always be covered under ACV, along with all other personal property (which must be insured separately) and any damages covered under an NFIP commercial flood insurance policy. When a flood strikes, your number one concern will be getting your life—and your home—back to normal. That’s why it is important to learn more about what parts of your home are covered and which parts are not covered before a flood strikes, so you know what to expect when it’s time to call your flood insurance company. For example, when your policy says it covers “physical damage” that doesn’t mean it covers all damage to your property. In fact, it only covers items touched by flood waters and/or damaged as a “direct” result of a flood. 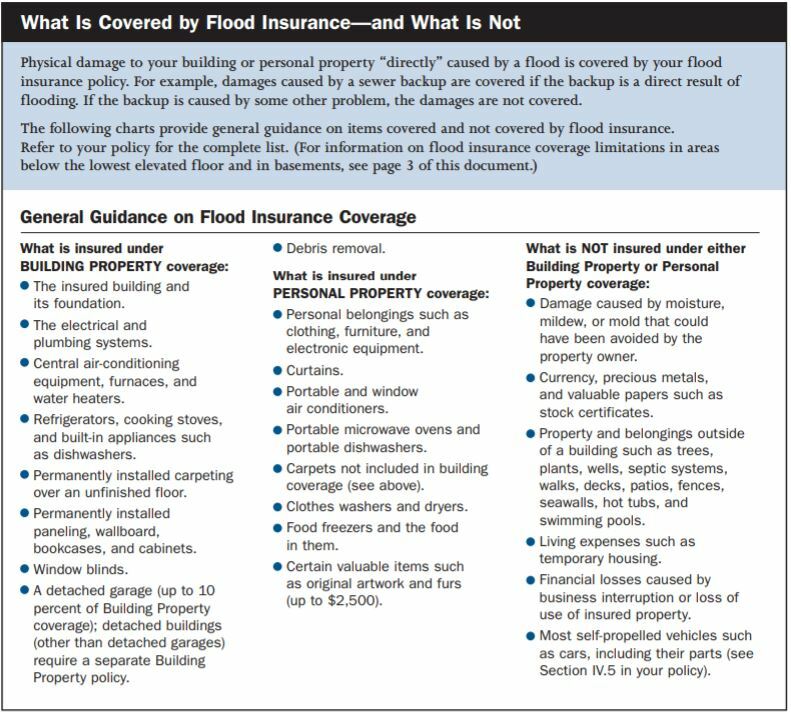 The good news is FEMA’s residential and commercial summaries of coverage make it easy to know what your NFIP flood policy covers and if you need excess flood coverage—coverage that goes above and beyond the $250,000 limit offered by an NFIP policy—to ensure your life can return to normal after a flood. *This guide from FEMA.gov provides general guidance only. Please refer to your policy for complete list. Now is the time to review your policy and ensure you have the coverage you need for both your property and your home. If you have questions about your policy, are interested in purchasing excess flood coverage, or want to learn more about flood insurance, call Wright Flood or your local agent today.